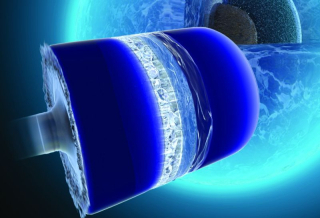 A weird phase of water called ice-VII, a critical tipping point for the demise of Angkor, and when rock moves like a fluid are among this week’s physics highlights. Greed Is Not Good: Study finds prior research claiming 1 in 5 CEOs are likely to be psychopaths was flawed. “We did not find a particularly high rate of psychopathy in CEOs or corporate leaders.” Also: there was a gender bias, in that acting like a psychopath is an advantage for male CEOs, not so much for women. Some Houses Are Born Bad: Latest adaptation of The Haunting of Hill House will haunt your dreams. Netflix series reimagines Shirley Jackson’s classic horror novel, stays true to spirit. How Does The “Shape” Of An Electron Limit Particle Physics? The ACME experiment has released new result showing the “roundness” of the electron, which are touted as a test of fundamental physics theories. Atoms may come apart as the Universe’s biggest stars explode. Something we found in a particle accelerator could explain massive stars’ supernovae. Science Isn’t About ‘the Truth’—It’s About Building Models. These are the three key things that any person should know about the nature of science.